Tea with the fragrant flavour of orange, bergamot & lemon. Foil sealed for freshness. Bright with zesty orange.They say behind every great man is an even greater women. Inspired by rolling orange and lemon groves, we developed Lady Grey for Earl Grey lovers who wanted something a little bit fruitier. 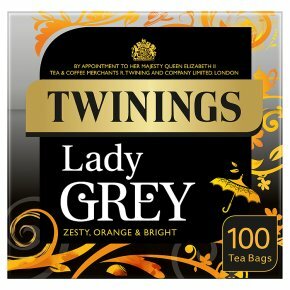 We couldn't possibly play favourites, but Lady Grey will always have a special place in our hearts. What does it taste like? A light, refreshing tea with juicy citrus notes. Delicious and full of zesty brightness. What makes this tea different? The zesty orange. It's the perfect addition for its refreshing fruity flavour. It's the original and still the best. How do I drink it? Brew for two to three minutes for a ladylike cup. Add a splash of milk if you like. Or drink it as it is to bring out the citrus.